On my birthday I caught the ferry across the Gulf of Finland from Estonia to Finland. We were greeted by swarms of seagulls swooping and diving to get a close look at the newcomers. I rode off the ferry under warm blue skies into Helsinki. For much of the year it’s not known for the greatest weather on earth, but the summer is mostly beautiful. Even though it was my birthday all I really felt like doing was finding a nice place to camp by a lake and chill. In Tallinn it was up all night go go go. I headed west out of the city and before long I was in the country side riding on quiet two lane roads through farmland. After exploring for the day, I found a big lake on my map and set in search of a home for the night. After a few dead ends and private properties, I found a small gravel road that led down to the lake shore. If there’s one thing that Finland doesn’t have a shortage in its lakes. Over 187,000 dot the country. Maybe the first birthday I’ve ever spent alone, but I was just fine with it, and enjoyed a night of watching movies and drinking homemade pear slivovitz from my cousin in Slovenia. Everywhere in Finland I was greeted with open arms and treated with nothing but kindness. This was especially true of a refugee camp I happened to stumble upon in the middle of nowhere. I saw a little lake just off the main road and decided to stop by for a break. Following little gravel roads, I ended up in a little grassy area with a dock out into the lake. A young guy was fishing with a stick that had fishing line tied to the tip, and a tiny hook on the end with dough as bait. After striking up conversation I found out he was a Somalian refugee and lived at a camp up the road. Back up in the forest was an old hospital that the government had turned into a refugee camp. A little while later a young man from Kurdistan showed up to fish as well. 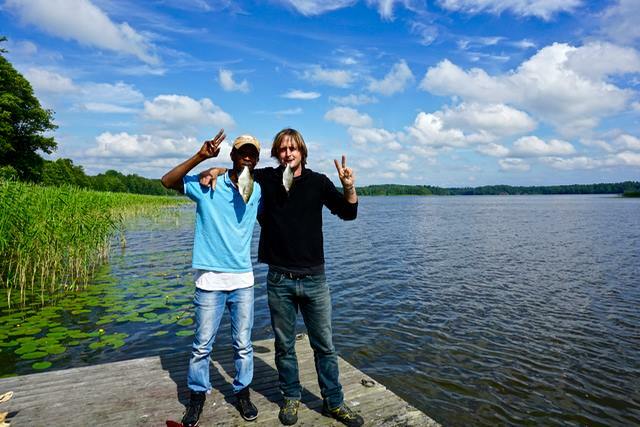 My new friend Abdisalaan had some kind of special touch because he had no problem catching fish, but the guy from Kurdistan was having no luck. With nothing to do living out in the middle of nowhere, and not allowed to work, he spends a lot of his time fishing down at the lake. He gives them to the women of the camp to cook up. A little while later an older guy showed up along with a younger fellow. The Older one was from Syria and the younger from Algeria. Geez were they friendly and full of positive energy. The Syrian man, who rocked the track suit, wrote some arabic on a couple of places on my bike and was very interested to talk to me. You can really feel someones kindness when it’s sincere. The younger guy, from Algeria was a crack up. He was Mr. Suave and loved to tell stories. The four of them all had their own sad, but inspiring stories. None of them had given up. Abdisalaan had fled Somalia years ago when Al-Shabaab (a terrorist group) wanted him dead basically because he was a comedian that made jokes about them. He lived for years in Kenya where he made good money working and would send most of it home. 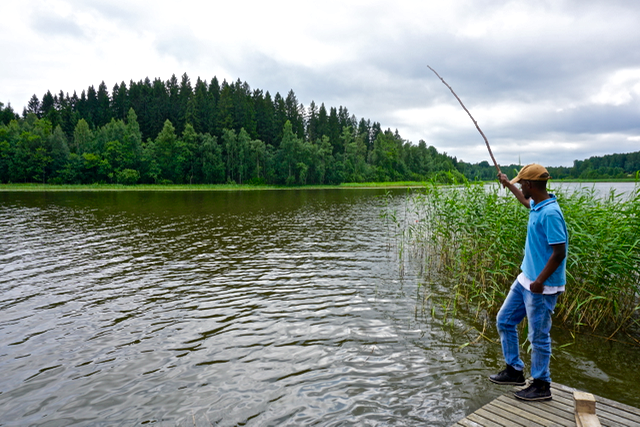 Then Kenya decided to crack down on the illegal workers and he immigrated to Europe until finding himself at the refugee camp in southern Finland. The young man from Kurdistan had fled from his home, which was ravaged by the war. Kurdistan is the small region in northern Iraq on the Turkish border where there’s intense fighting going on with ISIS. He’d been separated from his family and ended up at this refugee camp. Mr. Suave, from Algeria, had been living in refugee camps for a long time and had a lot of hopes and dreams for his life. Despite having no family, no home, no money, and pretty much no country anymore, he had as positive of an outlook on life as he possibly could. 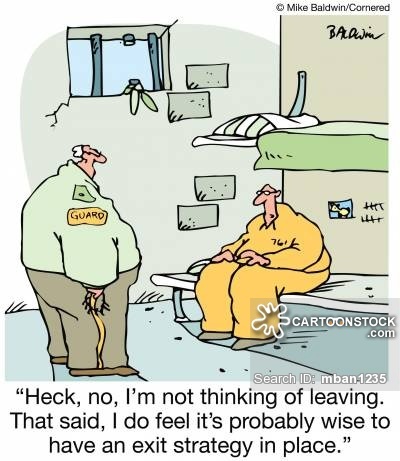 He wrapped it all up inside a good sense of humor to be able to deal with living there. Mr. Track Suit was almost sixty, and had seen his home and entire city destroyed in the war. Before Syria entered the civil war he was a lawyer and lived a comfortable happy life with his two sons and wife. Him and his family were able to escape and the four of them are now living at the camp. After fishing for a while, Abdisalaan took me up to the camp through the forest. He showed me where to look for wild blueberries, which I did all the rest of my time in Scandinavia. Kids played carefree everywhere outside the old hospital as moms watched on. He introduced me to some friends and checked me in as a guest. They are served meals, but he doesn’t like the Finnish cooking so he gets supplies from a small market to cook some of his own meals. He shared a room with another young Somalian guy who couldn’t be more that 19. You could tell it used to be a hospital and the beds are actual old hospital beds. Abdisalaan cooked me a salmon and pasta lunch, which was delicious. He was really happy to have a visitor and a new friend to talk to. It has to be hard living out there with nothing to do. He was an amazing guy to meet. Before I left he wanted to take this picture. 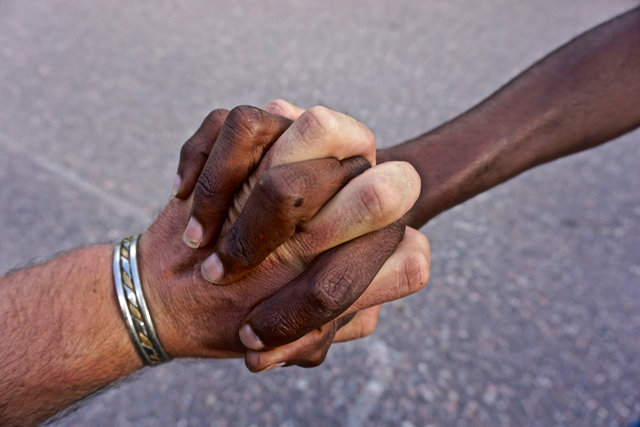 Just showing the friendship between two people from different sides of the globe, with different skin color, different religions, and a completely different background can share love with each-other. The refugee crisis in Europe is a very complex issue and I’m not going to even begin to dive into that or act like I know the best solution. Saying that, I do know that they are just regular people looking for a better life exactly how we all would in their shoes. Many people around the world have negative feelings towards the refugees and automatically label much of them as muslim terrorists. Going to the camp and meeting these young men and their families was very powerful. You can’t have a true feeling for it or think you know what it’s like for the people until meeting and get to know them. It tears at my heart to think about the hundreds of thousands of others just like them. It’s a life that nobody can truly imagine unless they’ve lived it, and nobody deserves to live it. I now have much more of an appreciation for what they go through. I ended up one night looking for a place to camp in the archipelago around Raseborg. It’s an amazingly beautiful area, especially in the late part of the day with the sun setting. Colorful clouds reflect off the water and large deer hop through the fields. I had no luck for a while finding a spot by the water and kept arriving at people’s houses. Eventually I followed the yellow brick road to one of the greatest wild camping spots ever. A tiny cabin, a grassy area, a rocky shoreline with tiny beach, and a dock out into the sea. I was stoked and set up. The moment I was finished, three people came walking down the path towards me. Automatically I knew it must be the land owners. Finland is amazing, just like Sweden and Norway, it’s free to camp on any public lands and even most private land is fine, especially when you ask the landowner. It seemed like nobody was around, but apparently I passed a couple of them and didn’t see their waving arms. They seemed a bit suspicious of me at first, but once they heard my story, everything became very friendly. They couldn’t believe I was able to find the place. I had to show them on my map how I had stumbled upon the small road. It was crazy to them that anyone was able to find it and never remembered it ever happening before. After chatting all about this and that they wished me a pleasant night and walked home. I was grateful to them letting me enjoy their little slice of heaven for a night and promised to leave it exactly as I’d found it. I could live in that little yellow cabin by the sea very happily. Throw in a little boat and a dog and I would be content forever. The colorful sunset was gorgeous out over the archipelago. 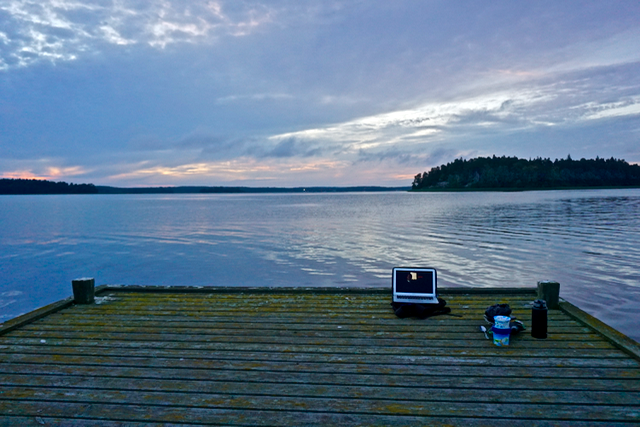 I had my own private cinema for the night on the dock. Memorable times. At six in the morning the following day I had a ferry over to Sweden. I had planned on just camping by the beach and getting up super early to head over to the port, but it turned into a very strange night that is tough to put into words. I met an old lady in the parking lot who was very friendly and seemed fairly sane. Her two friends showed up and she was very insistent that she get me a place to stay. Telling her no thanks was of no use and I finally said screw it and went with it. Usually this kind of situation turns into something really amazing and fun, but this time it dissolved into insanity. I followed her to the house where her friend would “let me stay”, but turned out to be a giant drunk man. They argued and debated forever. Then told me I could sleep in this bathroom hall, but people would be walking over me. I felt kidnapped by her for the next couple hours, and she would get very angry and strange when I would say I was just gonna go. I even made the mistake of getting in her car to go find some guy at a store who apparently I could stay with. That was the most frightening ride of my life in her tiny car. The more she blabbered nonsense to me the more it became apparent that she was a bit whacky. Of all the times traveling when I just went with the flow and saw what happened out of a strange situation, this one ended the worse. Probably the only time it ever ended badly. To make a long story short, I was able to escape my captivity at a gas station and then spent a few hours in a 24 hour diner before going to the port for my ferry to Sweden. I got on that boat and passed the hell out. This entry was posted in adventure travel, border crossing, camping, finland travel, Kawasaki KLR650, life advice, locals, Motorcycle world travel, Photography, travel friends and tagged archipelago, best of, camping, finland, fishing, free, friends, motorcycle, photography, refugee camp, route, sunset, travel, wild. Bookmark the permalink. Very interesting with beautiful photos! The old lady sounds like a real winner!!! You have some very amazing encounters with a variety of people.